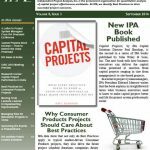 Capital Projects, by IPA Capital Solutions Director Paul Barshop, is the second in a series of IPA books published by John Wiley & Sons, Inc. The new book tells how business executives can deliver the capital value promised at sanction from capital projects ranging in size from megaprojects to site-based projects. In a letter to project system managers, IPA President Edward Merrow writes that Barshop’s book explains in straightforward terms what business executives need to know to make capital projects better and life for project system professionals easier. An excerpt from the book on delivering promised project value to stakeholders is also included in this newsletter. IPA data show that not only do Best Practices apply to typical market-driven Consumer Products projects, they also drive the faster project schedule durations companies desire. As such, Consumer Products companies have good reasons to focus on the practices that deliver better business results through capital effectiveness. IPA’s Keith Mayo and Jordan Sealock provide insights into project practices they recently identified as driving faster Consumer Products schedules. As many as 1,000 plants are estimated to be relocated or upgraded in China. IPA data on relocation projects performed globally show that these projects demonstrate poor predictability; on average, they slipped their execution schedules by 14 percent and overran their budgets by 7 percent, thereby weakening the return on investment to business. A team of IPA project analysts takes a closer look at what is causing so many companies to consider these projects in China and how execution risks for relocation projects can be mitigated. Capital Project Performance in India – What Are Key Success Factors?